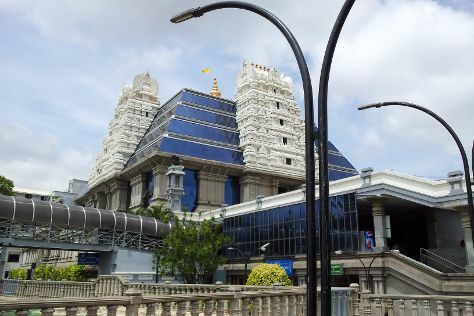 Kick off your visit on the 27th (Sat): admire the natural beauty at Lalbagh Botanical Garden, then walk around Cubbon Park, then explore the historical opulence of Bangalore Palace, and finally take in the spiritual surroundings of ISKCON Temple Bangalore. To find photos, ratings, other places to visit, and more tourist information, use the Bengaluru day trip planning site . The Route module shows you all the different ways you can get to Bengaluru. In April, plan for daily highs up to 41°C, and evening lows to 26°C. Cap off your sightseeing on the 27th (Sat) early enough to go by car to Kodagu (Coorg). On the 28th (Sun), admire the natural beauty at Raja's Seat, then take in the spiritual surroundings of Omkareshwara Temple, then make a trip to Raja's Tomb ( Gadhige), and finally admire the sheer force of Abbi Falls. To find photos, maps, where to stay, and tourist information, read our Kodagu (Coorg) online trip itinerary planner . You can drive from Bengaluru to Kodagu (Coorg) in 4 hours. Other options are to do a combination of flight and taxi; or take a bus. Finish up your sightseeing early on the 28th (Sun) so you can go by car back home.